Japanese early 20th century bamboo flower basket. The basket is of oval form with handle wrapped in fine bamboo strips. The basket is woven first with medium strips of dark bamboo and then very fine strips ar woven in on top of that. Unsigned. 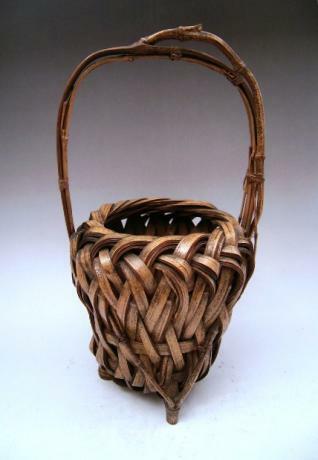 The basket measures 16 1/2" tall , 8" wide and 7 1/2..
Japanese early 20th century bamboo flower basket. Unsigned. The basket is 15 1/2" tall, by 7" wide by 6 1/2" deep. Japanese 20th century small bamboo flower basket. The basket is beautifully woven with medium sized bamboo strips that are about 5 layers thick, giving mass to the basket. The handle is made from strips of bamboo and thin natural stalks of bamboo. 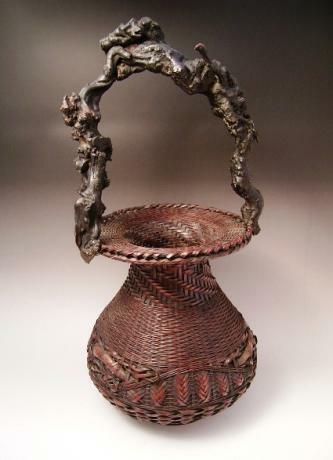 The basket measures 13 1/4" tall by 7" in diame..
Japanese mid 20th century bamboo flower basket. 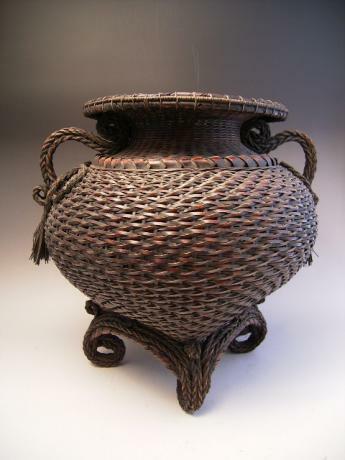 The basket is of large vase form with side handles and decoration. 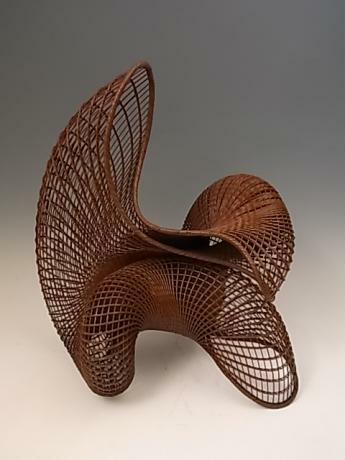 Even the stand is woven attached, with 4 curved feet. 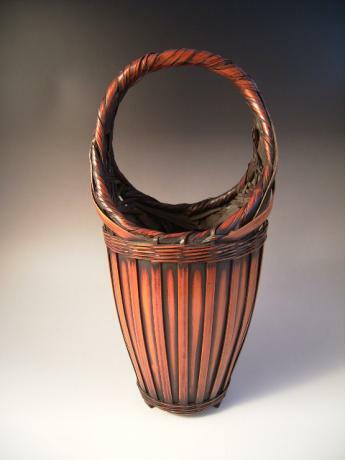 The basket is woven with medium and fine strips of bamboo. Signed CHIKUSEKI-SAI. 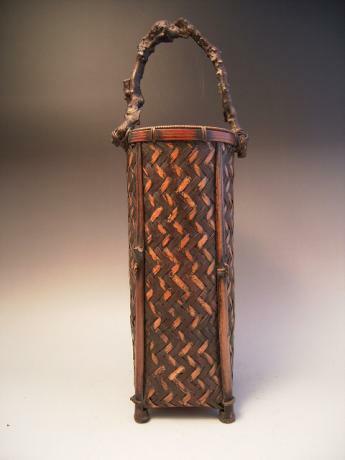 The basket measures 13" tall, 14" wide and 14"..
Japanese early 20th century Japanese bamboo flower basket. Beautifully woven with a variety of different width bamboo strips and with a Mulberry root handle. Unsigned. 22 1/2" tall by 5 1/2" diameter. Japanese early 20th century bamboo flower basket. 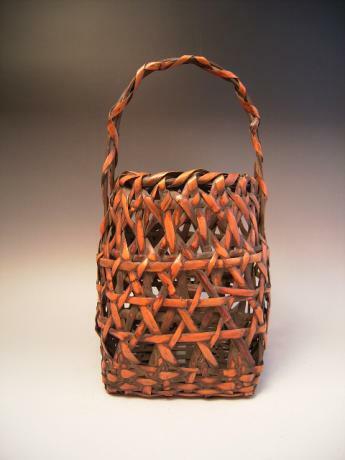 The basket is woven with medium bamboo strips. Unsigned. 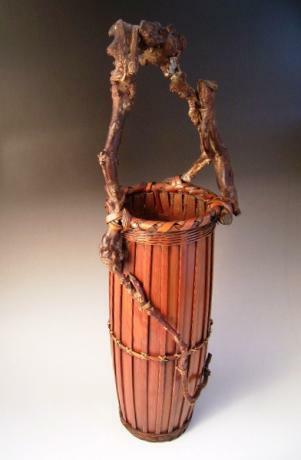 The basket measures 14 1/2" tall and 7 1/2" wide and 6" deep. The bottom is a square shape. 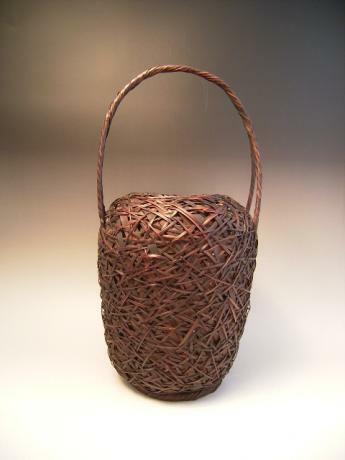 Japanese 21st century bamboo basket by basket artist HONDA SYOSYU. HONDA SYORYU was born in 1951. He orignally made baskets for the traditional Japanese floral arranging art, however the constraints held back his creativity. 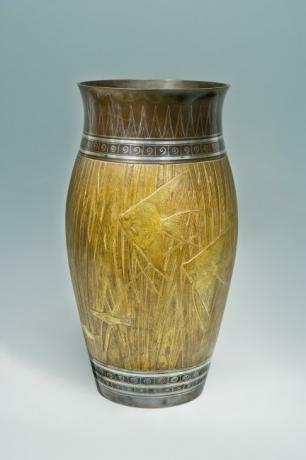 As an innovator he continue working with his fascination with line, volum..
Japanese early 20th (1936) century bronze vase by artist MATSUBARA HARUO (1907-1982). He was an artist that had his works of art at all the major exhibitions, such as SHINBUNTEN, NITTEN, GENZAIKOGEITEN, etc. The vase has the design of angelfish and water plants. The vase measures 13 1/2" tall b..